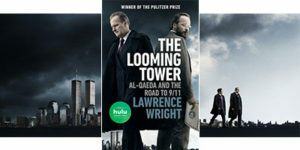 Lawrence Wright’s THE LOOMING TOWER: Al-Qaeda and the Road to 9/11 (Knopf/Vintage), which won the 2007 Pulitzer Prize for General Nonfiction, has been adapted into a 10-episode Hulu original series and debuts tonight. Starring Jeff Daniels, Peter Sarsgaard, Alec Baldwin and Tahar Rahim, the gripping narrative spans five decades, powerfully illuminating the growth of Islamic fundamentalism, the rise of al-Qaeda, and the intelligence failures that culminated in the 9/11 attacks. In THE LOOMING TOWER – Vintage published an updated tie-in edition on February 2 – Wright re-creates firsthand the transformation of Osama bin Laden and Ayman al-Zawahiri from incompetent and idealistic soldiers in Afghanistan to leaders of the most successful terrorist group in history. He follows FBI counterterrorism chief John O’Neill as he uncovers the emerging danger from al-Qaeda in the 1990s and struggles to track this new threat. Wright developed the TV adaptation of THE LOOMING TOWER with screenwriter Dan Futterman, whose Hollywood scripts include Capote and Foxcatcher, and filmmaker Alex Gibney, who directed an HBO documentary based Wright’s 2013 book, GOING CLEAR: Scientology, Hollywood and the Prison of Belief (Vintage). Futterman, Gibney and Wright are the series’ executive producers, while Futterman served as showrunner and Gibney directed multiple episodes.